Look forward to seeing some pics of your journey! 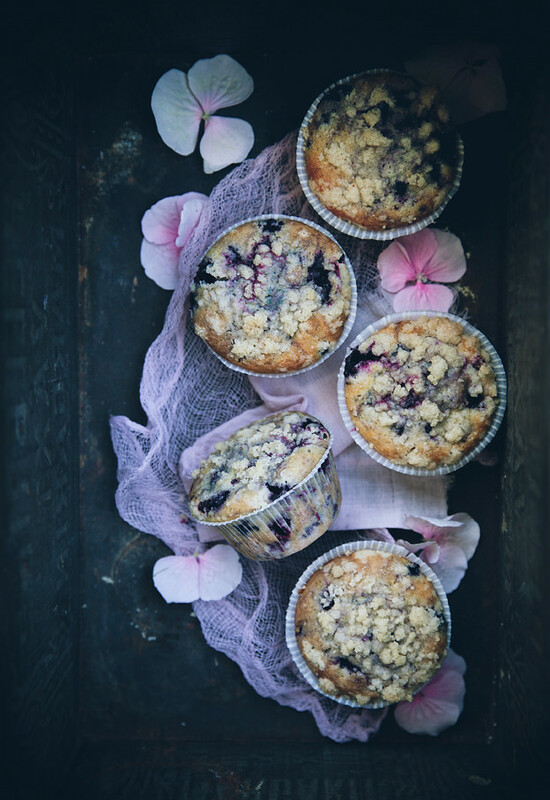 These blueberry muffins look divine! I especially love the idea that you spiced the crumble with cardamom. Have a fabulous time in Iceland! I've dreamed about a visit to this island for so long already. Can't wait to see it through your eyes! These are magical. Love that topping!! 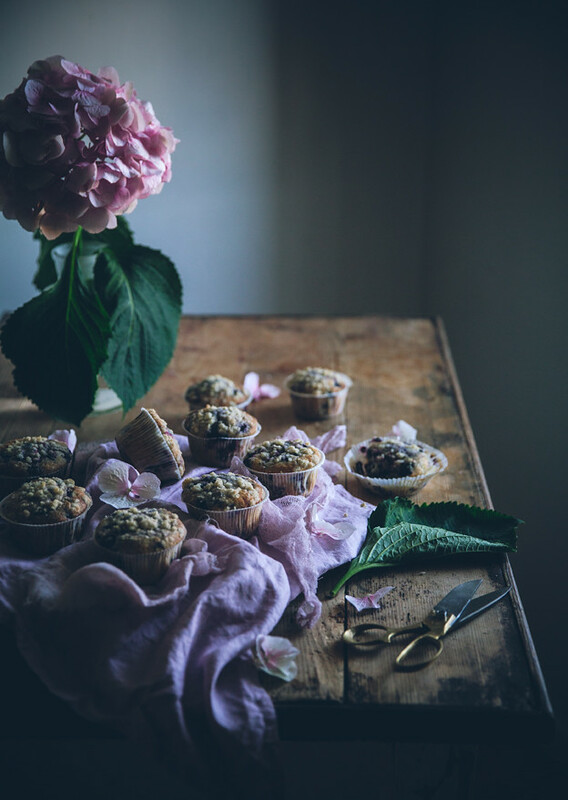 Beautiful photos and the muffins look amazing! Have a wonderful time in Iceland, that one is on my "to do" list too!!! 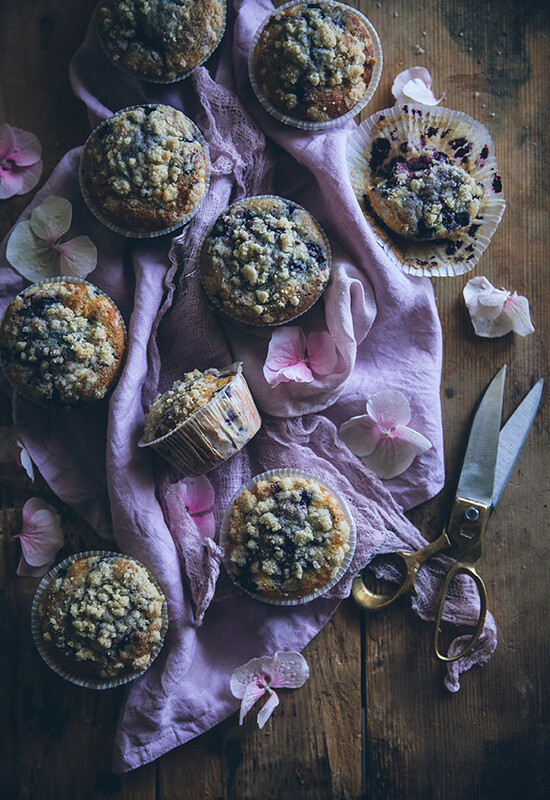 Blueberry lemon muffins are my absolute favourite and you have styled these so prettily. What beauties. these look heavenly..and that crumble yum. hope you have a great time on your trip. I've actually just gotten back from Iceland! It was an amazing trip and wrote a whole post about it! Nice! I'll have a look right now! Cardamon crumble sounds absolutely heavenly!! Sei fonte di grande ispirazione, sia per le ricette che per le fotografie, incredibile! Merci pour cette recette, je l'ai essayé hier, seulement j'ai remplacé les myrtilles par des mûres! Se fut un délice! I love the idea of adding cardamom to the crumble. That sounds delicious! 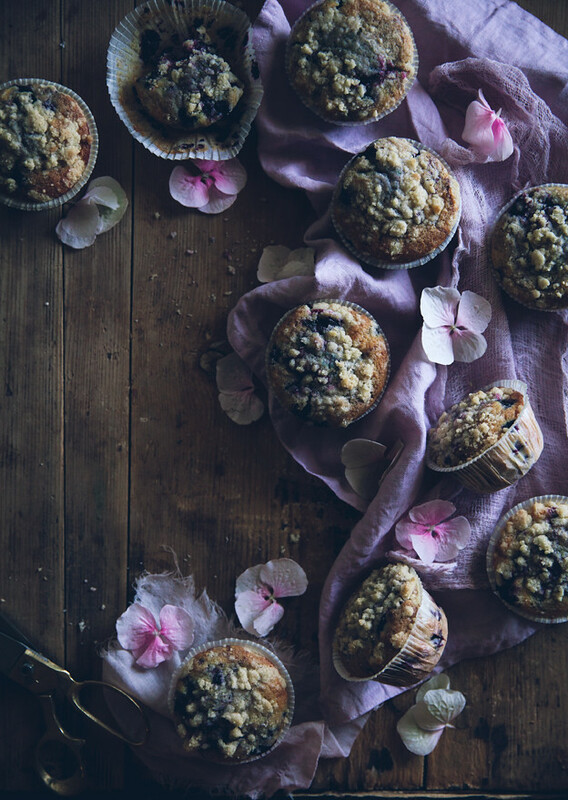 oh my…these muffins look so delish!! and the pictures are more than beautiful! These look amazing! I love blueberry and cardamom! Definitely need to try these! 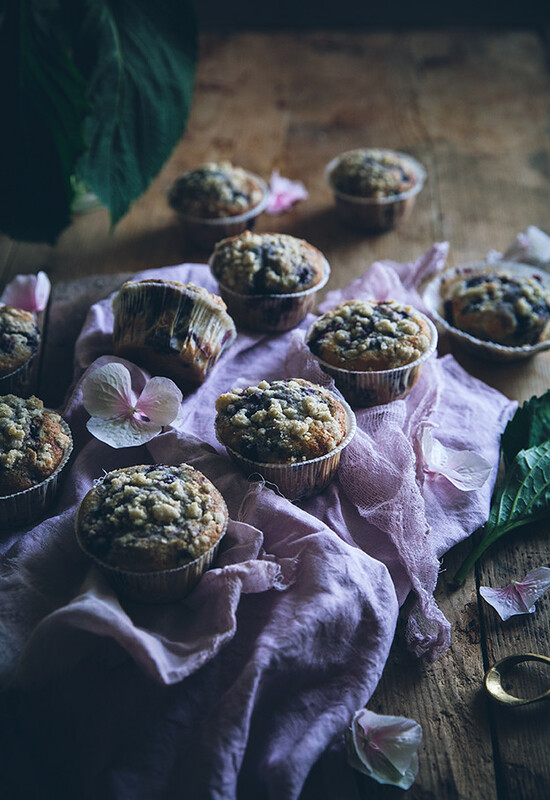 I just love freshly baked muffins and these sound wonderful, especially that cardamon crumble – wow! These images are exquisite. Pretty sure I've never seen a more beautiful muffin. The flavors are right up my alley. Wishing you a smooth and relaxing journey, Linda. They look amazing!And lovely lovely pictures! Happy ti discover a fabulous blog! Cardamom is my total favorite! I have packing nightmares too…and lists every where! 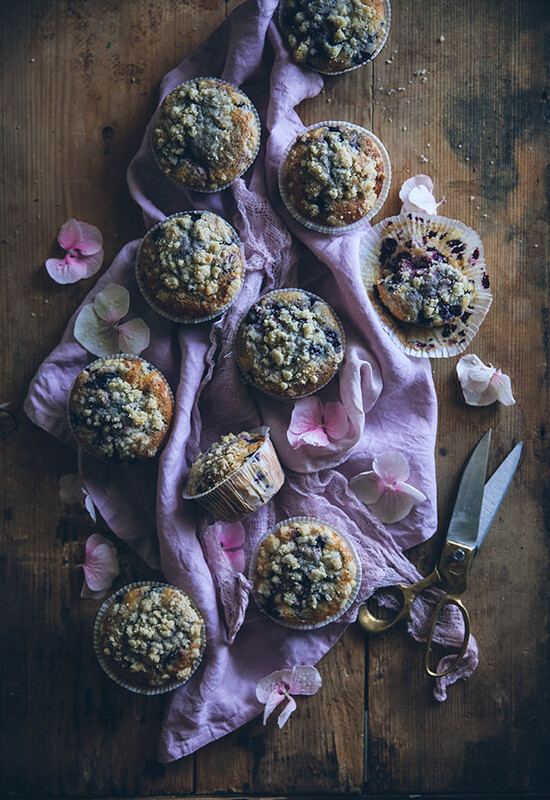 That crumble topping is divine, beautiful muffins! I made these yesterday, and OH MY GOD, they were delicious. The lemon zest and the crumble topping really made the difference. Thank you so much for sharing the recipe! And lovely photos by the way. Love your blog. My name is Elin and I have read your blog and I really liked your recipes! I work for a website called myTaste.com and I would love for you to join us! Your photos are so stunning! I just love your style so much and you're such a creative genius! They look so scrumptious! 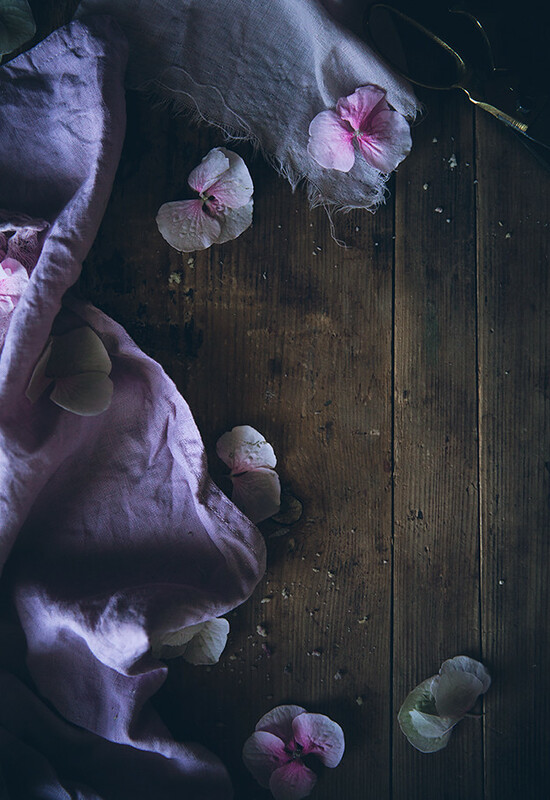 What lovely photographs and styling! Made this (and double chocolate muffins) for "fredagsfika" at work today. Lovely!!! Accidently took 1/2 tablespoon instead of teaspoon of cardamom for the crumble but that did not matter 🙂 Got soo many nice compliments about them. Thank you so much for sharing! And you have such a lovely blog! Yay! So glad you and your workmates enjoyed them! And more cardamom is always better in my opinion 😉 Thank you Jenny! Me and my LieberMann, like to read in your wonderful blog and to have a look at the amazing pics! We are glad to have a look at your blog next time. Your muffins looks amazing and have a wonderful trip. Iceland has been on our bucket list of places to go for some time…I've flown over and had a layover in Iceland several times but have not actually visited the country. Once it was perfectly clear skies and it was like I was watching a travel video…so beautiful the aerial view was! I replaced the yogurt by buttermilk and it worked perfectly. Best blueberry muffin recipe I've found, they were beautiful! These sound delicious and your photography is breathtaking! Tried these recently with full-fat Greek yoghurt. They were delicious! A real hit with everyone who tasted them. Very easy to make, too. I heartily recommend this recipe to anyone who makes it this far down in the comments. Thanks for sharing this recipe! Gah! Everything you do looks amazing ! I love these muffins! I’ve made them twice – the first time I followed the recipe exactly, and the second time I substituted some vanilla extract and cinnamon for the lemon and used sanding sugar on the tops instead of the crumble. Delicious either way! Thanks for the wonderful recipe!